FROM THE LION'S DEN, Volume 02, Issue 02. I want to apologize to everyone for not getting a newsletter out any sooner. The last one went out in February! As you can imagine, a lot has transpired since that newsletter! For one, we had five staff members leave our team…all on their own terms. Some moved because spouses got new jobs, others were on a one-year commitment, and one left to focus on studying for the MCAT. Their time with us was super valuable, and they each will be hard to replace. But like He has done so frequently with our organization, God has filled those spots with eager and excited new staff. In the next newsletter, we will give an update on each new teacher. Finishing our fourth year as a school, I think back to the beginning. Those seventh graders are now eleventh graders and have grown in every aspect of life. Out of the original ten seventh graders, we have three left. And as one would think, those three have given themselves so many more opportunities because they have stuck with it. One wants to be a pharmacist, one an engineer, and one a plastic surgeon. And the best part about those goals is, because of the work they have put in, there is a chance all three could be working in those fields in ten years. My prayer is that God moves in their hearts to use those career choices as a catalyst for them to glorify God and love their neighbors just as Christ loves us. And I have to constantly remind myself that the seven others that are no longer enrolled at DSA still can have a hope. The hole might be a little deeper to dig out of, but nevertheless, they can still get out with the help of the Holy Spirit and the Church. So thank you for your prayers and support the last four years…and please keep praying as the upcoming school year is right around the corner. During the fourth nine weeks, we had the amazing opportunity to spend a week in Mentone, Alabama at Camp Alpine for Boys and sit under the teaching of Seth Still, the RUF minister at Delta State University. While there, we hiked, fished, played dodge ball, basketball, and soccer, and spent one-day climbing in the trees on the ropes course. When one steps back from the race of the everyday grind and retreats to a place where there are no cell phones, internet, or tv, it does something to your soul. Our guys did not even mention the college basketball Final Four which was happening during our trip because they were so engaged in the activities and outdoors of camp. The directors of Alpine made the trip possible and their staff were so hospitable and gracious. The food was worth it alone! And as we were leaving, the directors asked when we were coming back. As we closed out the school year, we finished with 44 students. This was the first year our sophomores and juniors took the ACT, and while we still have much to improve, the guys' average was a little higher than a 17. We had two guys score a 20. As the students move to the next grade, we are anticipating great strides in their performances. The average ACT in Leflore County Schools is just shy of a 15 and the Greenwood Public Schools is just above a 15. As a school, our ACT goal is the national average, which falls just above a 20. Like any new organization, we have all kinds of room to grow and change how some things are done, and there are a few adjustments we will be making that hopefully will raise the bar for our students’ attitude toward academic excellence. The last you heard about athletics, we were in the thick of the basketball playoffs. By the end, we had come in third place after a buzzer beater shot kept us from making it to the 1A championship game. We then had the amazing opportunity to play in the Overall MAIS Basketball Tournament at Mississippi College. We came out hot the first quarter and were leading by 9, but the opposing team made a defensive switch and unfortunately Coach Howard was not able to make the adjustment in time. We got out scored 25-2 in the second quarter. If you know of anyone interested in coaching basketball, send all contacts to Coach Howard! Kwatravous Johnson was named Greenwood Commonwealth Player of the Year as a sophomore. We are excited about next year and look to compete for the state championship again. The coaching was much better in track; Coach Derek Hinckley and Coach Wilson Whitten put the guys through a great training program and when we competed in the state meet, we had multiple guys place in the events: Justin Anderson placed first in the 800 M and tied for second in the high jump; Jalen Bedell placed second in the shot put; Justin Cooper came in third in the 1600 by a couple of inches and second in the 3200. 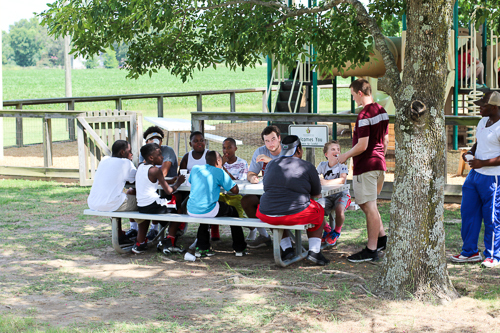 For a week in July, Delta Streets hosted Camp of Champions, coinciding with Vacation Bible School that took place at First Baptist. Rising 6th and 7th graders met at First Baptist for a time of praise and worship and a short devotion, and were then bused over to Westminster Presbyterian Church where they participated in different sports. We worked on basketball, soccer, football, and cheer and dance too. Thank you to the team from Lakeside Presbyterian Church in Brandon, MS, who joined us for the week, as well as the many local volunteers who took time to work one on one with these students. It was hot, but it was a great opportunity to get everyone out of the house and moving, and we hope to have some of the campers attend DSA in the fall.